The world is full of compromises that actually work really, really well. Consider the sports sedan, with its combination of speed and space. Or the iPhone in its phone/camera/music player/other stuff hyperconveneince. 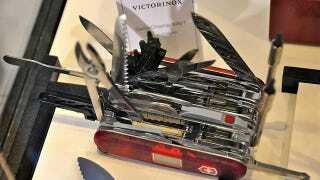 Or the venerable Swiss Army knife, a right-sized collection of tools that all work pretty damn well. Yes, purity of intention is a noble thing, and there are times when there's no substitute for a Ka-Bar or a Caterham, but on the whole it's always impressive to package a few things together and maintain a high level of functionality. Sometimes those sets of tools are just perfectly obvious, sometimes they are an inspired blending of the unexpected. According to Elon Musk, there was more to the line in the picture that's been cropped out. The real line is actually, "It's a brick (duh duh duh duh) HOUSE." Meaning your Tesla can double as an emergency living space if the battery dies. It's actually a value added feature.